At DeKalb Health, we’ve created a whole new environment to help you welcome a newborn into your family. 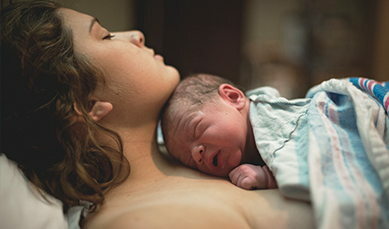 We take a fresh approach to every stage of your miraculous journey, from prenatal care and childbirth classes, through a personalized birthing experience, to expert post-natal pampering and lactation support. The new Family BirthPlace features luxurious all-private suites where mom, baby, and family will spend the entire experience —without having to move. Each spacious suite has a private bath, shower, and vanity, and the welcoming furnishings include a convenient sofa bed or a queen size bed. Each suite also has free Wi-Fi, as well as cable TV and DVD/VCR access, and a large whirlpool jacuzzi is available for hydrotherapy, relaxation and water births. Special photography and video packages are available through Michelle Glenn Photography to capture these special moments. The Family BirthPlace was designed to ensure seamless continuity of care guided by your doctor, from labor through delivery and recovery. The Family BirthPlace is staffed with an experienced and highly skilled nursing team, who specialize in caring for newborns — as well as a team of board-certified OB/Gyns, pediatricians, family physicians, midwives and a board-certified lactation consultant. Most importantly, the entire medical staff is committed to providing expert, compassionate care and support in a welcoming environment that surrounds you with family and friends. DeKalb Health ranked in the top 10 percent of all hospitals in PRC’s nationwide database, based on overall quality of care patient ratings.DeKalb Health ranked in the top 10 percent of all hospitals in PRC’s nationwide database, based on overall quality of care patient ratings. When you choose to have your baby at the Family BirthPlace, you have the peace of mind of knowing that you have the support of advanced fetal monitoring and surveillance systems. You also receive the most up-to-date approach to post-natal care, including the HALO sleep sack program for the safest swaddling of newborns. In addition, our Transitional Care Nursery is equipped to provide for all of your baby’s needs.